Have you ever come across a a bird egg on the ground or in a nest and wondered what kind of bird laid that egg? It can be a real puzzler especially if you do not see any bird activity nearby. 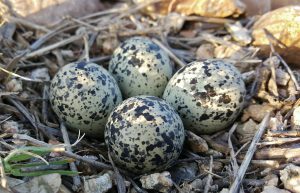 Here’s the good news…identifying bird eggs is easy if you know what to look for and do a little detective work. It has to do with the size of the egg, the color of the egg, number of eggs in the clutch, the type of nest it is in or came from, and the location of the nest. Each bird species is different when it comes to laying eggs and building nests and by learning more about them it will make it easier for you to identify them. Read on for some things to look for……. The size of the egg is relative to the size of the bird. A robin egg will be bigger than a house wren egg and a house wren egg will be bigger than a hummingbird egg. Bigger birds have big eggs, smaller birds have smaller eggs. Not too difficult right? In most cases, the color of a bird’s egg has something to do with where its nest is located. For example, most cavity nesting birds lay all white or some white eggs. Cavity nesting birds are those that build their nests inside the cavity of dead trees or poles, or in nesting boxes. Owls, woodpeckers, tree swallows, and martins all lay white eggs. Bluebirds are also cavity nesters and while they generally lay pale blue eggs they sometimes also lay white eggs too. Why are cavity nester’s eggs white? It is easier for them to find these eggs in dark holes. 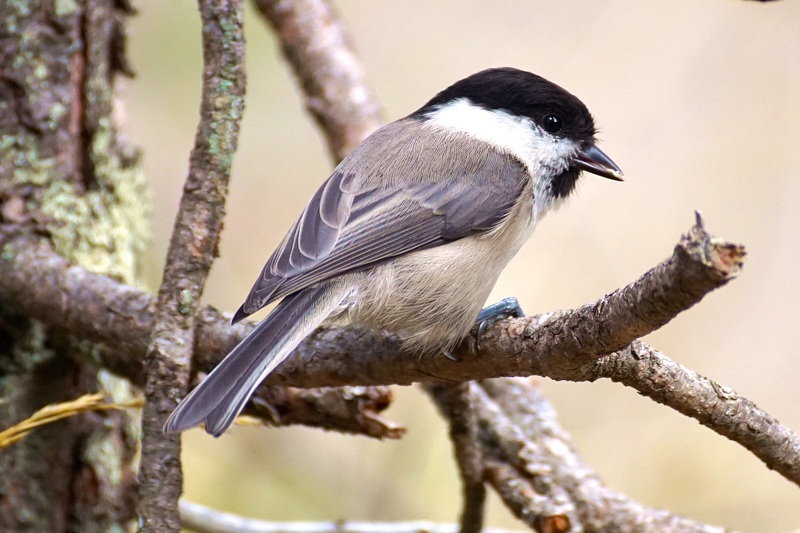 Other cavity nesting birds such as the chickadees, titmice, nuthatches, sparrows, and wrens lay white eggs but have spots, dots, or blotches on them too. On the other hand, many birds that nest on the open ground lay camouflaged colored eggs. Shorebirds such as killdeer, plover, and seagulls all fall into this category. The camouflaged eggs are for a good reason, to deter predators like snakes, raccoons, or turtles from finding and eating them. Then there are the birds that build their nests in trees or shrubs. Robins, blue jays, cardinals, and mockingbirds fit in this category. Their eggs are generally light brown, green, or blue eggs, some with markings and some without. 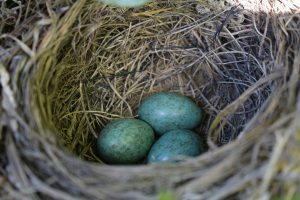 A clutch is the number of eggs that a bird lays. Most songbirds lay anywhere from two to seven eggs. Songbirds are blue jays, cardinals, wrens, chickadees, titmice, and nuthatches just to name a few. Hummingbirds lay from one to three eggs, owls one to four eggs, woodpeckers three to five eggs, and raptors up to four eggs. Size, shape, materials, and location of a nest is another clue to help determine the bird species that built it. 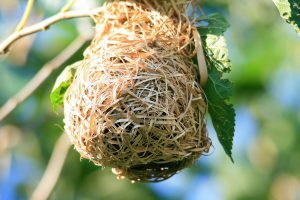 Each bird species has a certain size nest, shape, and certain materials that it uses for its nest building. Nests may be made of mud, sticks, feathers, grass, moss, pine needles, and other similar type materials. Some nests may be tightly woven while others may be loosely packed. Some may be more rounded while others are cup shaped, some may be a closed dome shape with side entrances, some may be a hanging pouch. Some birds build their nest lower to the ground at eye level in trees or shrubs like the robin, while other birds build their nests up on platforms such as ospreys and eagles. Take note of location and habitat too. Is there water nearby, some birds need to have a water source in close proximity such as swifts and swallows? Is it in the woods or is it in your garden or in a planter? It really is not that difficult to determine which bird species laid the egg when you do a little detective work. It all depends on where you find the egg, its color and size, and the type of nest that you find it in…(i.e. its shape, the materials it is made of, location). For example, if you happen to find a white egg about the size of a golf ball at the bottom of a dead tree that has an entry hole, it is probably laid by an owl. 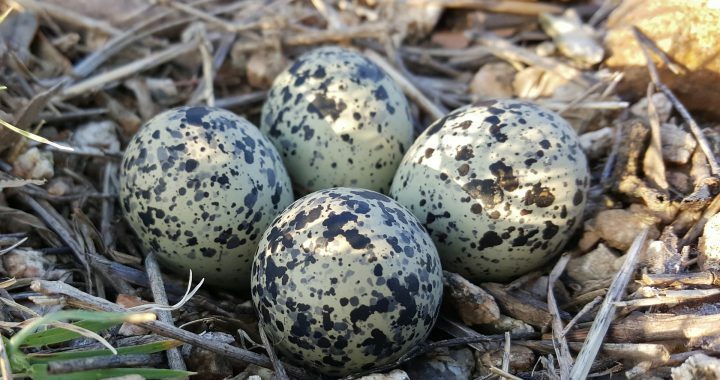 A camouflaged looking egg found on the ground near the shore in gravel or grasses is most likely a type of shorebird such as a killdeer, gull, or plover. If you find a very small egg that looks like a jelly bean and is in a nest that is very tiny made of plant lichens, plant down and fibers, it is a hummingbird nest. 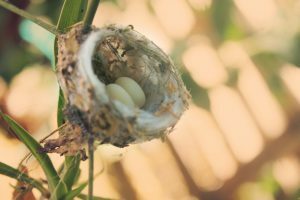 Of course hummingbird nests are a little harder to come across but can be located. Sometimes you can solve the puzzle fairly quickly by just observing bird activity near the nest. The adults will be taking turns guarding the nest and will be flying in and out throughout the day. You might have to watch for a few minutes but eventually you may see one if the nest is active. Just keep your distance so as not to disturb the birds. If there is no bird activity at all then gather all the information that you can and look it up in a birding field guide. My husband and I have several that we use which are very helpful. If you still cannot figure it out or if you have any questions, let me know in the comments below. I would be more than happy to help you with this. Posted in Backyard Birds, Songbirds and tagged bird nests, identify bird eggs. ← Should You Feed Birds In Summer?